Chinese New Year is just around the corner. In fact, it is less than a month from now. 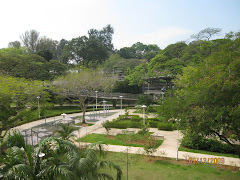 But, my wife and I shall not be in Singapore. It will be the first time that we broke the tradition to be away instead of staying at home to welcome family members, relatives and friends who came visiting annually. 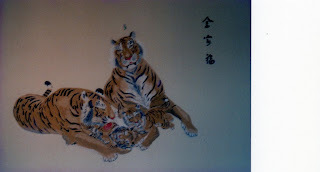 This new lunar year will be the year of the Tiger. I like the strong, brave and courages tiger. It evokes my memories that my eldest child was born under that zodiac sign. 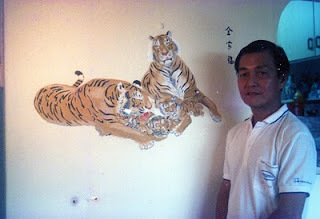 It also gave me the inspiration to paint a family of tiger. I am not am artist and do not have a canvas and oil paints. So, the wall was my canvas. Instead of oil paints, I used ICI or Nippon wall paints mixed with postal colours. My handiwork is shown below. Nice and unique painting,I would like to view it during this chinese new year period. My best wishes to you and Auntie Mary and a very prosperous year for both you and your family. Thanks pchan, we also wish you and your family a Happy & Prosperous Chinese New Year. wow! you definitely qualify as an artist! very well drawn picture. Best regards to PChew for a Happy & Prosperous Lunar New Year for the protection everywhere and every time and "Kong Hei Fatt Choy" for the Year of the Tiger to you and your family. Have a happiness and enjoyable holiday trip. Cheers!